Castlewood's ORB uses 3.5-inch removable media with a capacity of 2.2 GB, more than any other product in its category. The drive has an impressive transfer rate of 12.2 MBps. ORB disks can be used in a variety of applications that require storage of large amounts of large files and digital data, such as music and video editing, graphic design, publishing, and multimedia presentations. Information technology markets are expected to use ORB drives as a way to easily and quickly back up data and increase PC storage. 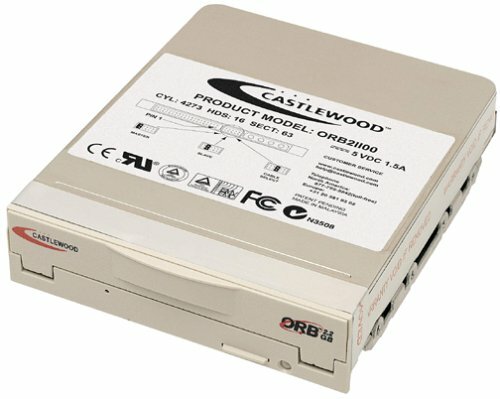 The Castlewood ORB external SCSI drive was a solution to my need for an easily replaceable boot disk. I boot a dual PIII to WIN98SE, Linux 6.1 and 7.0, Solaris 7, WIN2000, and WinXP. Each on a seperate ORB disk. I have had the ORB for over 1 year and it has worked very well. I had to do some tweeking with Linux 6.1 and Solaris. All others installed with no problems. Because this system is used for development, I don't demand high activity rates from the OS. (C/C++ Libs are on SCSI fixed HDs. The only complaint I have is the availability of media at less than MSRP. My first SCSI Orb was actually a USB connected unit that I chose to use in its SCSI connection for speed. (The USB Orb is just a SCSI with a special cable attachment.) It lasted more than a year. Apparently, I was lucky. When it misbehaved, finally, it flashed the amber light continuously. I could hear the motor turning on for an interval, and then turning off. After some time, the disk ejected. I never got that green light that indicated the drive was ready. The Orb was essentially dead. Since I was outside my warranty period, I purchased another; this time a straight SCSI unit. It exhibited the same difficulty as my last drive, but this time right out of the box. I tried a number of disks, including a brand new one and nothing helped. I sent the unit back and three weeks later -- received its replacement. Imagine my chagrin when I found this new one exhibiting the very same difficulty? Is it possible I received two faulty drives? Was it possible I was doing something wrong, (after successfully doing it right with my first unit for better than a year)? Or was there some design and/or quality control difficulty with the SCSI unit itself? Attempts to contact Castlewood by phone were all in vain. I even sent an extensive explanation of my difficulties via E-mail; but to date, there has been no answer. I recently asked the vendor for my money back. I simply gave up. In the meantime, I have 130.00 dollars worth of Orb disks that are totally useless -- to say nothing of the backup material thereon. I often wondered why Castlewood did not swamp Iomega in their sales, since with the former, one got so much more for the money. Now I know. I still my have SCSI connected Zip drive after four years. It works just fine. The Orb is, apparently, poor quality merchandise. It is a great idea, but it simply doesn't measure up in practical terms. Further, I find now that both the product and the company -- with reference to its customer support -- leave much to be desired. I bought the original aqua-blue version of the Orb Drive about 15 months ago. I got the USB version, and I recomend this one for a very important reason: The USB version is actualy the SCSI external drive with a USB - to - SCSI adapter. Meaning, you can use it BOTH ways as a SCSI or USB. I HIGHLY recomend this drive to anyone. I bought one of these a year or so ago, and 1 of the 3 discs I bought didn't work right out of the box. The drive itself lasted about 3 months before it broke completely. I've been calling orb constantly ever since trying to get them to replace the drive (under its warranty), and have finally resorted to writing them letting them know I'm contacting my lawyer. Luckily, I had a friend who had an orb drive of his own, so I was able to get my data off of the discs that did work. Don't be fooled like I was by these people. I have been using the external SCSI ORB drive since April. I have found it to be reliable and reasonable high performance. Occasionally a disk does not load correctly the first time but a re-insertion solves the problem. I use mine through an Adaptec PC-Card and it has survived traveling in a laptop bag. I plan to buy a Cardbus SCSI card to improve performance. It is a good product; just wish more people had it. I have used the Zip drives and I must say I like the ORB much more. It seems faster (USB) than the ZIP and makes allot less noise. You can also throw the drive in your backpack without damaging, just like the ZIP. The disc on the other hand is a bit more delicate. The disc has to be placed backwards into the disc box, you have to get used to that. I would have liked it if you could remove the disc from the drive and insert it into the box the same way it came out of the drive. I would have liked it if the drive could run from the power of the USB port, but since it is actually a SCSI drive it is probably not possible. Sometimes the SCSI cable unplugs from the drive if you transport the drive in your backpack (after throwing it in :) ). The latches are not very big to keep the cable fastened to the drive. It would also be nice to have the drive and disc available in South Africa for a good price. At the moment you have to import it yourself and pay allot on shipping and wait weeks to get it. This is probably the best storage/backup solution for standalone computers(if you're a sysad and need to backup whole divisional servers, better stick w/ industrial tape drives;)). Very fast, flexible and reliable, cost per MB is hard to beat, overall a better solution than Zip disks or CD/RW for storage and you can even use it as a secondary HD(it's fast enough to put a Windows swapfile on it!!!). Best of all, they just announced a 5.7GB version. This is truely like having a 2.2 gig removable hard drive. Very fast, and massive. Easy to use, just like a hard drive. The only problems I have had (and heard other people also have the problem) is that sometimes the disk does not read initially when you insert it. However, clicking retry always works and then the disk is fine to use as long as it is in the drive. I have used this for over 2 years. Apart from one faulty disk, which was replaced foc. I have had no reliability issues at all. The drive was easy to install. I have a 500 MHz AMD K6-2 system, with 2 SCSI and one IDE hard drive. I get data transfer rates of about 7Mbyte/sec, according to the Adaptec SCSIbench utility. This compares with 3.5Mbyte/sec for an old CONNER CP30540 hard drive, and 9Mbyte/sec for a SEAGATE Barracuda SX19171. The speed and size of the 2.2GByte disks facilitates the chore of doing backups. I also find it a useful way of transferring very large files between PCs that are not networked. 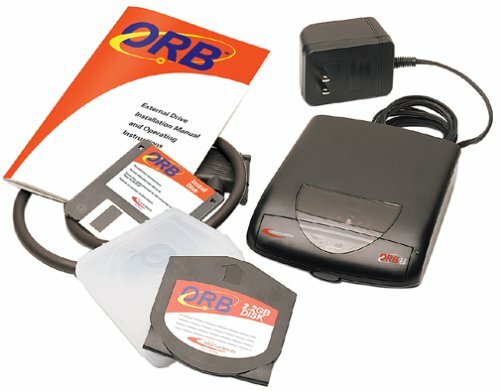 These ORB drives are way better than burning CDs or ZIP drives if you have a lot of data, and they are way faster than tape backups. My only gripe is that the price of the disks, at about $40 each, has not declined at anything like the rate of hard drives in the last 2 years. They also do not seem to be readily available in all stores. Fast, efficient backup system. Disks are a bit pricey. I own about 3 Orb drives now, and find them very useful. I have both the USB and SCSI ones, and I find them, for the most part, equally fast. Sometimes the USB one gets slow, but then I disconnect it and reconnect it and it works fine. I use them on a daily basis to synchronize ALL my work files (about 1.2 gigs) using Laplink, then I take the small Orb disk home and work from the Orb disk while at home. It sure beats carrying around an 8 pound laptop every day. I run it on Windows NT, Win98 and Win ME computers. It is certainly much cheaper than ... Jaz 2GB disks, and since a rewriteable DVD costs about ..., it is fairly comparable in price to them as well (although some RW-DVDs can hold 5+ GB). One important catch: NEVER use the eject button on the front of the drive to eject the disk as it can corrupt the data--always eject the disk using the right mouse click-->eject option. I use my ORB 2.2GB (USB model) bought in 2001 in England to back-up my laptop's hard drive. I found it very easy to install under Windows 2000, the O/S detects the drive automatically which appears as a removable hard disk in Explorer. Performance is good, I usually back up around 700MB in 20-25 minutes, certainly I don't feel it to be too slow. I have travelled internationally several times with my ORB and a few disks without experiencing any problem. The main issue I had was buying other disks in England in 2001 when Castlewood was supplying the US market first and most shops across the ocean ran out of stock. I wish those disks were more widely available, they are impossible to find in Mexico for example. Cheap, fast, good. Possibly 3 out of 3? I've had my Orb for more than a year, and admit I don't use it heavily. I've got the external SCSI2 version and a beige Mac g3/300MHz running OS 9.2 (for the sake of comparison). It was easy to install, easy to use, seems quite reliable. Fast enough random file access to keep me very happy. Vast improvement over backup with ZIP disks, which was starting to get silly for even 4GB partial backups. Tough to find the disks, I have to agree there with other reviewers. I ordered a bunch when I bought the drive, and re-use them. Have been looking to buy a new batch, and had to look a little harder than I thought. At first, they seemed to have disappeared from the face of the Earth, and I was ... that such a good product might have vanished... But I found a few places that carry them, though they aren't heavily advertised, as they were when they first came out. Only problem I've had is a little annoyance with the drive refusing to read the disk. I sometimes have to reinsert the disk a few times, or even restart the computer & drive before I get the disk recognized. I don't know if that's the fault of the disk, the driver, or the drive itself, but that seems to be the most common complaint around. However, it's just an intermittant problem for me, and I've been able to work around it without difficulty. Then again, I don't need to make large daily backups (monthly, at most). I suppose if I did, that problem would be more irksome. So beware- if you want to rely on this drive heavily, be cautious, it could be problematic. Whatever QC manufacturing problems they seem to be having haven't been surmounted yet. But if you just like the convenience of large, cheap, reusable storage, like I do, this is a far better alternative to a Jaz drive. Can not make it work. I've never had a problem with the Orb drive, although I've heard that other people have. I'm not sure why this is so, but I'm very happy with mine, which is why I give the 5 stars. I have the external USB/SCSI version, and four disks. I had one disk go bad on me, and Castlewood sent me a new one in no time. I've had my Orb drive for six months, and it has been great. It's so fast you'd never know it was removable. The Orb drive has kept me from needing a new computer, since I can infinitely increase my hard drive space for my mp3 fetish. The one problem is it's extrodinarily loud when it's "thinking," but it's a small price to pay. More storage for your money! Under most conditions, a great product. Fast, relatively affordable drive, compact media, convenient. But you have to consider replacement costs when you buy. I've had two of them fail -- one SCSI, one IDE -- both within weeks of the warranty ending (i.e. 13-15 months after purchase). Castlewood's fee to repair these things is $108 per drive, which is only [slightly] less than a brand new one! Factor in that you get a ...disc included when you buy a new drive, and basically it's a wash -- you might as well just buy a new drive! Competitor Iomega's track record isn't so great either, so I'm sticking with the Orb, but be careful -- the cost of this drive might be ...per year. Very fast, very reliable, and your system sees it as another hard drive, which is much more convenient than CD-RW. Using Norton Ghost, I can back up 3gb of data to one disk in about 15-20 minutes. I can also back up my drive at work in 10 minutes. It is the only MR drive on the market, which makes it the fastest. ... The only drawback is that it isn't optical storage, so you have to remember not to subject the disks to static or other magnetic fields, but I've been using this drive for 2 years and this technology (starting with the Syquest Syjet) for 5 years and have never had corrupted data. Does what it claims to do, nothing fancy. To date I've used the internal IDE version of the Orb drive in both Windows PCs and Mac G4 towers with good success. The drive functions as you'd expect. Performance is superior to that of comparable Iomega Jaz drives, though the Orb does have a much longer spin up/down cycle upon disk insertion / extraction. The drive door is also a bit inconvenient, as it requires two hands: one to hold the door open and the other to insert the disk. Mac users also take note that as of the time of this writing (Early June) no MacOS X drivers exist, but if you run MacOS 9.1 or earlier it works well. For the price this drive performs well and I have no major complaints. I bought my Orb drive for home use on the same day that I picked up a Zip drive for use at work. I cannot begin to describe how different these two products are. The Orb behaves almost exactly like a hard drive. It's very, very fast. The only noticeable difference is the slight spin time (which you can adjust through the software). The Zip (while the media may be ubiquitous) is really too small to be useful these days. The addition of the 250 mb model is a step in the right direction, but it's clear that Iomega dropped the ball here. 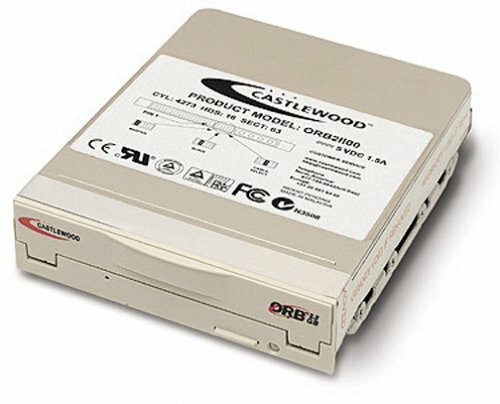 Castlewood has bridged the gap between the capacity of the very slow tape backup drive and the convenience of a removeable disk. Purchased this drive about two months ago and have found it to be the best (and cheapest) option for massive amounts of storage. Despite some reported problems in various reviews, I have not had even one problem with this drive and routinely use it to back up my hd and to store multimedia like MP3's. At $ for each 2.2gig cartridge, the ORB can't be beat! Remember when you got your Zip drive and suddenly floppies seemed, well, puny? After a bit of time with the Orb drive, you'll feel the same way about your Zips. The two devices are in about the same price range and are both available in external and internal configurations. The Orb media is two to three times more expensive (for now), but look at it this way--you could hold 20 Zip disks on one Orb disk! Add the fact that the Orb drive is as fast (or faster) than many for-real hard drives, and you've got a winner.